The ever-popular Morey's Piers has brought in a new attraction for the summer, as KONG is returning to the beachfront! 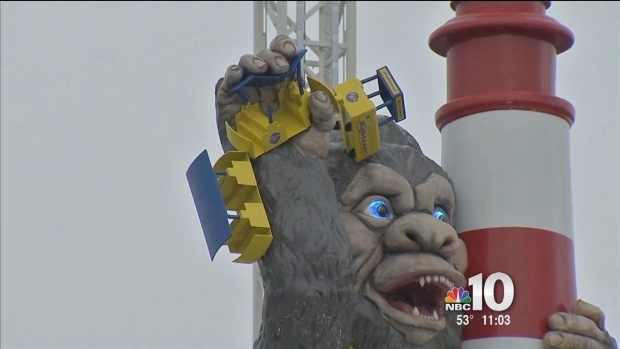 Located at Wildwood, NJ, the gorilla-themed amusement park ride is officially open this weekend as the new centerpiece of Surfside Pier. KONG- which originally was a 1970s staple of Wildwood- will sport an “I love Wildwood” t-shirt and clutch one of Wildwood’s well-known tram cars while hanging from a 60 feet tall lighthouse located at the center of the ride. Eight vintage world war planes will navigate swiftly around the infamous gorilla, elevating riders 26 feet in the air. KONG will also light up at night, as each vehicle is equipped with enhanced LED lighting. A brand new, 3,000 square foot retail space titled Kong & Co. has also been created, and it offers charging stations and comfy chairs, as well as scrumptious chocolate-covered frozen bananas and merchandise. NBC10's Randy Gyllenhaal gets a sneak peek at a new addition to Morey's Piers in North Wildwood, just in time for Memorial Day Weekend. Morey’s Piers was voted the third best seaside amusement park in the world by Amusement Today and #1 Best Beach Boardwalk by Family Vacation Critic. It features over 100 rides and attractions spanning over eighteen acres along six beach blocks and includes three amusement piers and two beachfront water parks. The next time you're planning a beach weekend down the shore, be sure to check out Wildwood and the new KONG ride!